Measure the pressure in a multitude of processes from hydraulic oils to chemicals. Ideal for compressors, pumping systems, irrigation system pressure, industrial process monitoring, hydraulic. Requires the E-S5VDC sensor converter to operate with E-2D/5D/16D. Temperature Limit: 0 to 200°F (-18 to 93°C). Compensation Temperature Range: 0 to 175°F (-18 to 79°C). 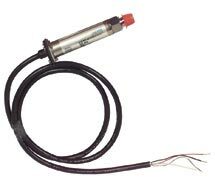 A wide range of models and connections that can meet pressure measurement specifications from low to very high are available. Contact an NTI product consultant for details. Monitor pressures in explosive atmospheres with barrier. Requires the E-S420MA-24V to operate with E-2D/5D/16D. Requires an E-ISZB Intrinsically Safe Barrier when used in hazardous locations.